By Scott Gilfoid: Trainer Emanuel Steward believes that WBA heavyweight champion David Haye’s talk of wanting to come out and blast IBF/WBO heavyweight champion Wladimir Klitschko out in the early rounds is a pure bluff on Haye’s part. Steward sees Haye as being all about theatrics and drama, saying that Haye’s showing of a southpaw stance in yesterday’s workout in Hamburg was more of the typical drama from Haye. Steward is concerned, however, with the rabbit punches that Haye has a tendency to throw in his fights. These are my thoughts as well. 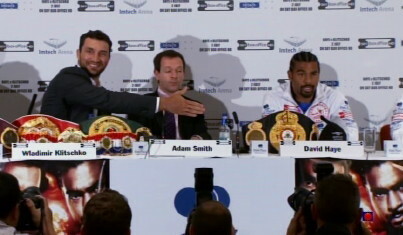 Haye won’t come out left handed because he would be taken out quickly by one of Wladimir’s straight hands or left hooks. You have to be working on stuff like that for a long time before trying it out in a fight. When guys do switch to southpaw, they don’t have a lot of success, even the really good fighters. They’re better off without making changes. Haye looked uncoordinated when he practicing out of the southpaw stance at the workout. If he does this in the fight, he’s asking to get knocked out a lot earlier than he would otherwise be. It sounds like Steward is resigned to the fact that Haye will be throwing rabbit punches on Saturday against Wladimir. Hopefully, the referee steps in and puts a stop to this by disqualifying Haye if he gets out of control and starts going rabbit crazy. We can’t have Haye knocking Wladimir senseless with rabbit shots.